There are so many steps in working with clients from start to finish. Obtaining the lead, booking the client, scheduling the services and finally the actual service you provide and all of these steps can have 5-10 mini steps involved and cause a lot of stress. Running your own business can be stressful enough! So how can you make your life easier? The answer is streamlining your creative process as much as possible. With the streamlining comes order, organisation and a much easier life. Less stress makes a happy business owner! I recently went through a complete overhaul with my business and my creative process and my main aim was to organise and simplify every step so my clients are kept in the loop and I’ll know exactly where I’m up to always. Below are a few of the methods I put in place to streamline my design process. How better to save yourself some time than to take yourself completely out of the picture? Automating is when you use a program to complete your tasks which means you don’t spend any time on it! There are many things you can automate to save yourself some time, including client emails, invoicing and project schedules. I personally use various systems to automate the booking of my client consultations, sending welcome packs when a design slot starts and sending any documents which are used for every project. I also schedule my blog and social media posts ahead of time so that is left to its own devices. On average, I would say I save myself at least 4-8 hours a week by using automation which I can use to complete work or give myself a break! One of the benefits of being self-employed at the moment is that there are hundreds of programs created specifically for freelancers which can all serve different purposes. With so many floating around, it is important that you find the ones which fit your business and, more importantly, your process. Think of the tasks you complete daily and then search for the apps and programs which can serve these purposes. I found most of the apps I use through recommendations on freelancer Facebook groups and I haven’t looked back! Spend a good amount of time researching the systems which are available for each part of your creative process as it can make or break how you streamline! As a people pleaser, I used to find myself giving clients timelines of mere weeks which seemed amazing to the client but unfortunately was unrealistic and I regularly myself found rushing before deadlines and being incredibly stressed. The more clients you book, the more you will get to know your own services and you will figure out how long it will take to complete your process from start to finish and this is valuable information. But, instead of giving clients this information, overestimate your deadlines a little. This will set realistic expectations for the client and give you a little breathing room if you encounter any unexpected delays. It’s tempting when trying to entice clients to offer the whole world in your service section. Faced with three similar packages at different prices, 90% of people will go with the cheapest option and not even consider the higher price. Not only does this make you less money but it makes it much more difficult to create an accurate forecast for your income. When I first planned my relaunch, I had four different packages planned, each of which was similar but had slightly different services included. After some excellent advice, I was convinced to cut down to one branding and website design package at a set price. This way I know what I will be getting and the process is exactly the same for every client. Working with clients is a two-way process and this can sometimes get lost in translation. Especially if you have tasks for your client to complete (which is likely in most creative businesses) it is important that you both work together to make sure everything is completed on time. Using my four-week design slot, it is important for clients to complete their side of the design so I can move on to each next step and finish the project on time. I have to be clear with my clients that my schedule can’t afford any delays and the quicker they get their part done, the quicker their designs will be launched! Make your deadlines for your client clear from the beginning of the process and set reminders before every part of the process needs to be completed and everything should run smoothly! 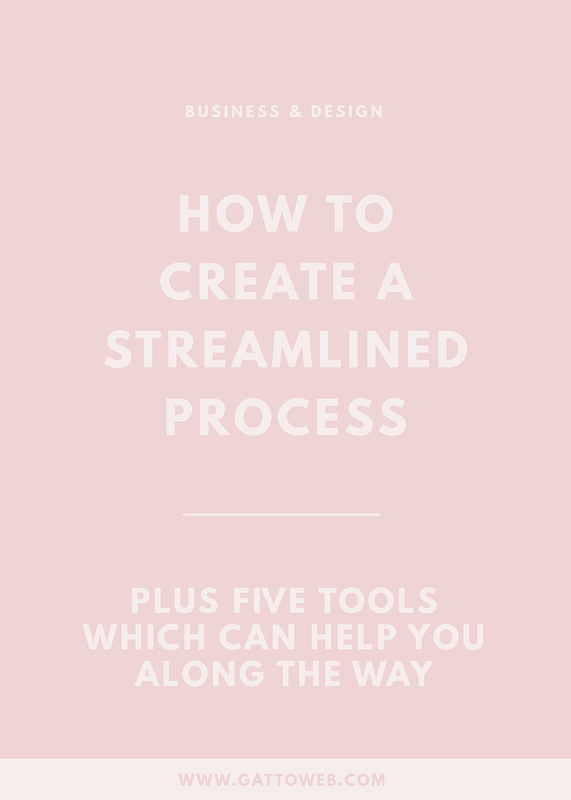 How do you streamline your creative or business process? I’d love to hear your recommendations and tips!